WASHINGTON (CNN) -- British Prime Minister Gordon Brown, speaking Wednesday to a joint meeting of Congress, highlighted the many bonds between his country and the U.S. and offered a hopeful vision that the world's problems can be overcome. 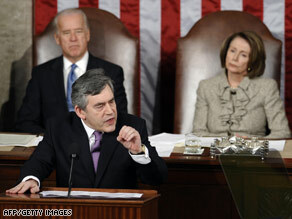 Joseph Biden and Nancy Pelosi watch Wednesday as Prime Minister Gordon Brown addresses Congress. "Working together, there is no challenge to which we are not equal, no obstacle that we cannot overcome, no aspiration so high that it cannot be achieved," Brown said in a speech punctuated by frequent standing ovations on both sides of the aisle. Brown hit on much the same theme Tuesday in an Oval Office meeting with President Obama in which the leaders said the "special relationship" between the U.S. and Great Britain not only will survive the current global economic turmoil but also will be strengthened in the long term. Brown's speech Wednesday centered on the economy and security concerns but also strongly highlighted the leadership role the United States plays in the world. "Throughout your history," he said, "Americans have led insurrections in the human imagination, have summoned revolutionary times through your belief that there is no such thing as an impossible endeavor. It is never possible to come here without having your faith in the future renewed." Brown pledged Britain's help in rooting out terrorism and other global threats. "And let me, therefore, promise you our continued support to ensure there is no hiding place for terrorists, no safe haven for terrorism," he said. Brown also paid tribute to U.S. and British soldiers in Iraq and Afghanistan, comparing their efforts -- and sacrifices -- to those endured by Allied soldiers in World War II. "And let me pay tribute to the soldiers, yours and ours, who again fight side by side in the plains of Afghanistan and the streets of Iraq, just as their forefathers fought side by side in the sands of Tunisia, on the beaches of Normandy and then on the bridges over the Rhine," Brown said, drawing a standing ovation. He continued, "Almost every family in Britain has a tie that binds them to America. So I want you to know that whenever a young American soldier or Marine, sailor or airman is killed in conflict anywhere in the world, we, the people of Britain, grieve with you. Know that your loss is our loss; your families' sorrow is our families' sorrow, and your nation's determination is our nation's determination that they shall not have died in vain." Speaking about the global recession, Brown outlined a series of measures to reignite growth, overhaul global institutions and lay the groundwork for a more environmentally friendly economic future. "In these days, the world has learned that what makes for the good economy makes for the good society," Brown said. "My father was a minister of the church, and I have learned again what I was taught by him: that wealth must help more than the wealthy, good fortune must serve more than the fortunate and riches must enrich not just some of us but all." At the beginning of his speech, Brown announced that Sen. Edward Kennedy, D-Massachusetts, is receiving an honorary knighthood. Kennedy, who underwent surgery for brain cancer last year, was not present, but his colleagues gave him a standing ovation when the honor was announced. In a statement, the long-serving Massachusetts Democrat and head of one of the most prominent families in American politics said that he is "deeply grateful."